Home > LED Dome Lights with Switch > FriLight 8710 Comet 12 Volt LED Adjustable Dome Light with rocker switch (10-30vdc). Plastic Surface mount with Glass Lens. Choose soft Warm White 3 Way LED, 190 Lumen Cool White, 170 Lumen Warm White, Red, Blue, or Bi-Color LEDs. Chrome or White fixture. FriLight 8710 Comet 12 Volt LED Adjustable Dome Light with rocker switch (10-30vdc). Plastic Surface mount with Glass Lens. Choose soft Warm White 3 Way LED, 190 Lumen Cool White, 170 Lumen Warm White, Red, Blue, or Bi-Color LEDs. Chrome or White fixture. Adjustable LED dome light with frosted glass lens. Plastic. Surface mount. Rocker switch on side. Swivel adjustment to direct light. 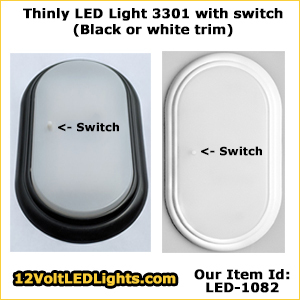 Interior RV lighting / boat lighting designed for use on 12 volt or 24 volt DC systems (acceptable voltage range is 10 volts dc minimum / 30 volts dc maximum). Includes energy efficient Bee Green LED Bulb with fuse and transient suppressor to protect current overload and voltage spikes. Choose LED bulb color: Warm White, Cool White, Red, or Blue. *** Choose a 3 Way LED Bulb. Alternate between brightness levels by toggling power off, then back on. Outstanding light that replaced an older, similar light. Really like the option of red light or white light. Much better switch than the original light. A: Look at the images at the top of this web page, and you will see one that shows "How to access the bulb in the FriLight 8710 Comet light fixture" - this image shows using a small screwdriver to remove the lens retaining ring. Be ready, as removing that ring may allow the lens to fall right out. Once the lens is removed, the bulb is accessible. If the lens does not fall out, then reinstall the retaining ring, and remove the fixture from the ceiling. Find a plastic cup larger in diameter than the lens, but smaller in diameter than the fixture body. Again, remove the retaining ring, set the fixture with the lens facing down into the plastic cup and slightly tap the cup against a bench top to jar the lens loose, capturing it in the cup.